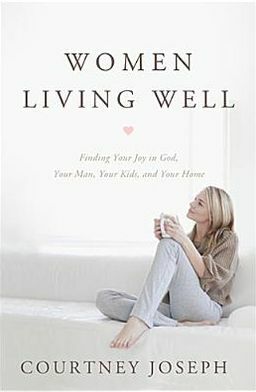 Women Living Well- A Review and A Giveaway! Women living well, now isn’t that something each of us ladies longs to do? We want to live well in our roles as wife, mother, homemaker, and most importantly daughter of the King. The answer to that question so often seems elusive. We throw ourselves fully into the role of motherhood and then wonder why our marriages suffer. Or we stress having the perfect house at the expense of relationship with our family. Maybe instead we are the ‘perfect’ wife, mother, and homemaker, but our lives still feel empty for some reason. That reason is because our lives are out of balance. In Courtney Joseph’s new book Women Living Well, she addresses these things. As she writes, she points you toward the one who will help you live well. Courtney encourages you to put first God, then your husband, and then your children. Her writing is easy, friendly, and loving. As you read through the book you will find yourself being led back to the bible to show you the principles that should look the same for all of us. As I was reading Women Living Well, I found myself greatly encouraged. There was not a section that didn’t touch my heart. Although for me there were two stand out sections that I just soaked up: Your Walk With The King and Your Parenting. Reading through the section, Your Walk With The King, has encouraged me to devote my quiet time each morning to reading my bible and praying. Yes there are 1000 other things I could do with it, but when I do that I walk away refreshed, recharged, and with a sense of peace. Reading the section, Your Parenting, two things stuck out to me. One was breaking the generational cycle of sin in a family. The other was the difference between teaching and training your children. Not only was I given the opportunity to read the book in advance, I am also being given the opportunity to give away a signed copy of the book! For the record the geek in me is doing a little dance for the winner of the giveaway already, and is a little jealous. Even with all the books I own and love to date, I still have yet to have a signed copy of a book. Now the giveaway will run until through next week Wednesday. When you leave a comment it asks for you email address. I promise it will stay between me and you. It does not get published for the world to see. I will not email you or send you anything unless you first sign up to receive my blog subscription. If you prefer to leave an anonymous comment just leave your name somewhere in the comment so I can identify you and know which comment is yours. Thank you. This entry was posted in Homemaking and tagged book review, giveaway on October 1, 2013 by Sara R.